Jonathan DeCosta was born and raised on the island of Maui. He graduated from Maui High School in 2013, where he took college-level programming and mechanical physics courses, and was in the video club, wrestling, and choir. 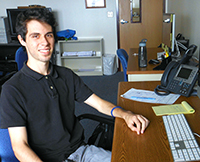 Following his goal of working in a technical field, Jonathan is currently attending the Electronic and Computer Engineering Technology (ECET) program at UH Maui College. He plans to go on to complete the bachelor’s degree in Engineering Technology at UHMC, and to seek a career that allows him to design and maintain Hawaii’s technology. Project Abstract: The Gemini Observatory uses website pages, Java applications, an external database, and email to provide their service. When observing, scientists must navigate through each medium to successfully gather their data. To simplify and personalize the experience, we first designed a Web portal. The portal contains important links and quick information for the P.I. to monitor how astronomical observations are proceeding. The portal will also merge other Gemini data sources such as schedules and forums. Research was done by interview and prototype-testing to identify whether these features of the observation process were worthy of this quick information hub. The webpage is decided to either be ideal or overlooked by the scientists when the user testing is completed. Ideal webpage design will be based on navigability, usefulness, amount of information, and how the users and staff members of Gemini react to its presence. A project charter will be made and submitted to Gemini management. The charter explains the Web portal’s uses and the impact it will have within Gemini, to afford the management team a well-developed decision on whether or not to use this new method of observing.